Summary: This is the basic set of tools you need on the trail plus a minimal survival kit. It doesn't include water or insulation, but includes ways of acquiring or manufacturing those things. What are folks carrying in their Original Kit Bags? What are folks carrying in their Recon Kit Bags? Will the kit bags take a holster? Equipages will always be evolving, but level 1 detail is complete now as are the resource thread links in the original post. ETA: The whole point of these dedicated equipage level threads is to agree / disagree / refine / suggest alternatives to the level detail lists. What we've got on the level detail pages is by no means authoritative. And the collective wisdom is going to be far greater than ours. So, post away if you've got something to say. Level 0.5 has already been slightly revised based on an email I received (which could just as well have been a post in the dedicated 0.5 thread). -I don't carry a kitbag, so this is largely on-body in terms of pockets and belt. If this is better suited for Level 0.5, feel free to move to that thread. -These are always evolving based on my experience and environment. -I've starred things that either I have found very useful, or things that I rarely see others use, but think more people should use. **Fixed Blade: Personal preference is for a Scandinavian grind, 4-5" blade with a well-rounded handle that fits the hand well. • Added red 550 cord lanyard for visibility if dropped, or for extra retention. ○ Dangler allows it to be attached to belt and comfortably carried in the R front pocket, still easily accessible, but safe from snagging and interference w/ backpack waist belt. • Current Carry: Mora Robust, modified as noted above. • Compass: Basic navigation; preference is for one with a mirror that can be used for signaling or removing something from eyes too. • Ball Cap: Sun and basic eye protection; acts like a sweat band. • Cell Phone: Back up nav, emergency contact, and kindle app. • Camo Buff: Good head and neck coverage props this above a bandana. • Concealment of face and neck if needed. • Headlamp: I like Petzl's Tikka 2+ (I think that's it). It's very light, bright, good battery life, and a smaller footprint than most headlamps. • Possible additions: I have been carrying these on occasion, and have not definitely decided on whether or not to keep them on my person or in the pack. • 2 person AMK "space blanket"
Why do you have water purification tabs but no container to hold water? A quart size ziploc takes up very little space and is better than nothing. Survival resources sells a great collapsible bag with gromets. I like the platypus 1L bags because I can screw them on to my Sawyer water filter. It's not a bad idea. I used to carry a bladder with level 1 but then did away with it on a "I've never used this once" purge. Part of the idea is that containers are easy enough to come by if you end up needing something. The DOJ survival kits include a small orange dry bag which serves dual duty as water and signalling and whatever else. This would be our choice for level 1. In fact Scot carries one in his level 1. BlairB, I think we all tend to think of level 1 in terms of essential stuff that we'd like to have on our body, or wouldn't like to be caught without. A less talked about attribute of the Level 1 (especially if you are thinking kit bag, belt, or cargo pocket carry), is convenient access to frequently used items. For example, while I don't always carry a 1L platypus on my level 1, I tend to use water purification tablets as my main water treatment system (out here in the rainy East, at least). So, I carry them in my level 1 because it's much more convenient to pop them out whenever I need to fill up, rather than digging for them in my bag like I did in my younger, less experienced days. As Evan, said since I learned the dry bag trick from Alpndrms I have been doing it. However, recently I have been reevaluating all my loadouts and I am not sure that is one that is going to stay in. Over the years I have carried the dry bag, a bladder, and a ziplock in that roll. The ziplock didn't last long and the bladder took up to much room. The dry bag isn't bad, but considering I haven't used any water container out of my kit bag in the something like 8 years I have carried a kit bag I am not sure I want it in there. I am still cogitating on it, but very well might be pulling it out. For those that do, what is your choice for a Kit Bag-sized fixed blade knife? This would be one that either is attached to the outside / underside (as with the Heavy Recon model), or carried inside the KB. Until very recently, I had been carrying a full-size Leatherman (Wave) and a smaller sized fixed blade. 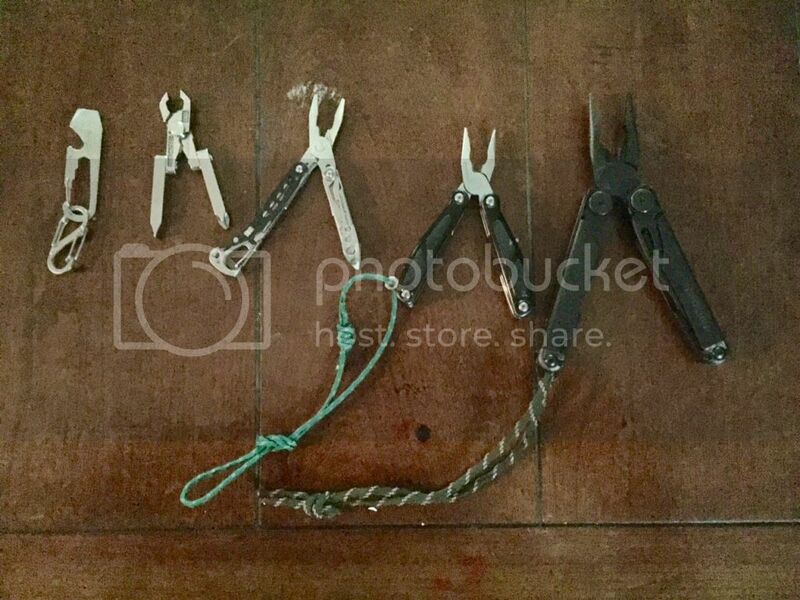 Although I really like having a full-sized tool available, I do believe I am going to move the Leatherman and have that ride with my dedicated survival kit pouch (carried in the pack). I figure if I am stopping long enough to make a repair on something or need pliers, then I am also probably removing my pack while doing so. I could also just carry the small folding multi-tool from my USG survival kit and move that to Kit Bag duty. This brings me to my real point and question....I currently have a Becker BK-11 in a custom Kydex sheath riding at the bottom of my HRKB. 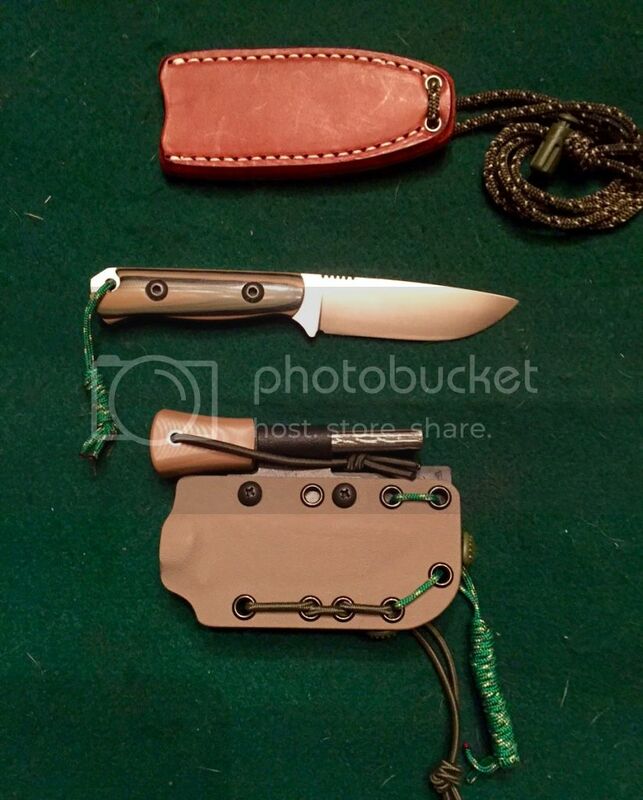 In my standard Original KB, I had been carrying a Bark River Ultralite Bushcrafter (CPM3V steel) in a leather sheath with an attached firesteel, dummy-cord secured into the KB. I just gave that knife away this past Friday to a tracker friend of mine (Mike Hull...also friends with Evan, Scot, Nick Boyle, and Superbadger). I don't regret for a second giving the knife away, but I instantly realized that I had a void in my KB. I went ahead and ordered a Bark River Bravo Necker 2 (also in CPM3V, as that I really like that steel) with a Kydex sheath and firesteel loop. This will be a really good size that I can carry inside of a KB, attached to the outside, or for belt carry. This knife isn't playing the role as my main blade, as that I always also carry a larger field knife on my Prairie Belt when in the backcountry...most of the time that is my Koster Bushmaster. To me, the Kit Bag knife is for small to medium chores, including food prep. It also serves as the back-up blade if separated from my main pack. I mulled it over a good bit before ordering this new Barkie...I like the look of the Bradford fixed blades...the Guardian 3 and 4 models, and I also like a new knife company I'd recently been introduced to...Wander Tactical's Lynx model. However, I think that one would be too big and heavy for inside or on a Kit Bag. I finally settled on a new Barkie, as that I like the design of the Necker 2's blade, the steel I prefer, the convex grind, and the good size. The handle will likely be too small for my hand, but I can rectify that with a small lanyard loop for my pinky finger. That's what I do with the Becker BK-11 and it works well. I know Evan already carries a really nice Wicked Fish blade attached to his HRKB. I can't remember if Scot is running something similar. I believe Nick is carrying a small Barkie in his. Badger probably does as well...a Benchmade Bushcrafter model. Can't remember if Steamboatsystema is running a KB knife. Can't remember if Strow is carrying a KB knife...but he probably is. I'm just running through some of the dudes I've hung out with during the Winter Gatherings. So...I was wondering what other folks are running in or on their Kit Bags. I reckon many will have ESEEs, Beckers, Barkies, or similar. Was there a particular set of criteria for the blade choice? Was it just because it was one that fit in or on the KB...or were there other reasons why? I.E.- game dressing / skinning duties, fish cleaning, camp / fire starting / wood processing duties, or self defense / combat / tactical duties? I'd love to see and hear about some of the other customs folks are running around with too, and why you all like them....ones that are a good Kit Bag-size. 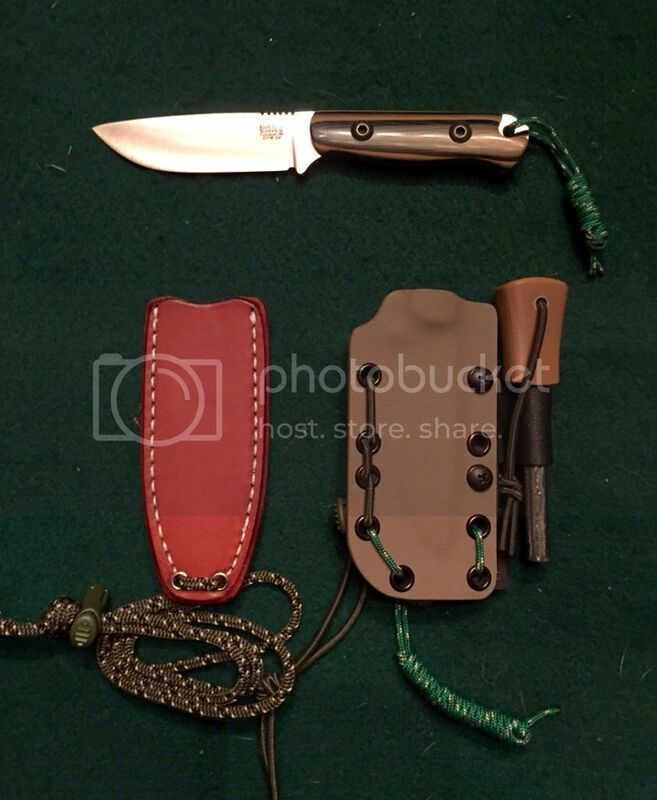 I've had another Koster on order for going on two years now...the Bushcraft model...but who knows how long it'll be before Dan Koster gets that ready for shipping. He seems to take quite a bit of time, but it is a true one-man operation. Edit: Although I love his work....I cannot recommend ordering one from him directly at Koster Knives, as that he is extremely slow with replying to customers, but expects them to give a down payment. Orders going out to on-line knife shops go out way faster, which has gotten a lot of customers with knives on order pretty upset....rightly so. If you want a Koster knife...get it from a business like Knives Ship Free or DLT Trading. Do not order from the knifemaker himself, as that you will likely be waiting for years. Hoping this will open up a nice, refreshing discussion among the many experienced backcountry folks here on the HPG Forum regarding the virtues of different blades that I'll call "Kit Bag Knives". I have the esee izula in the front of my snubby. It's a solid and quality choice without breaking the bank, and is fairly flat in profile, even with the factory micarta scales, but would prefer something a little bigger like the bk16 if it were my only knife for a while and I had a choice. For a smallish blade, I've come to appreciate the traditional style puukkos, but the handle shape doesn't lay as flat or stay in place in the pocket like the izula does. I don't like the epoxy/paint coating on the esee and becker knives, but it's fairly easy to remove with a little stripper (paint stripper, that is), and I like to use a little cold blue for a patina and convex the edge with sandpaper on a foam pad. I prefer to keep the knife inside the kit bag, and the izula is as big as I'd want to go in the snubby size. You could go bigger with a standard size bag or outside mount. For those that do, what is your choice for a Kit Bag-sized fixed blade knife? I've tried several fixed blade knives in the KB (mine is an "Original") and though they fit they were to large/bulky to leave in there. Recently I picked up a knife that makes a great EDC knife and I think I'll be transferring it to the KB when heading out. The knife I'm referring to is a Gossman UNK. Mine is in CMP154 but I think I'll pick up another in 3V once they become available. 3.25" long modified sheepsfoot blade, it's been great at everything I've needed it for. Haven't used it for critters yet but Scott Gossman likes them for cleaning his deer so I expect no issues there. He also makes a slightly larger version called the UFK but I think that would possibly be to large to go in the KB (but then I plan for a KB knife to be moved to a belt or shoulder strap after the KB is put on). I've been looking for a very similar size/ style blade for a long time as well. I've got a CRKT M-16 tha tfits nicely in the MOLLE on the front of my RKB. I've also had my Leatherman Wave but for lack of a better sheath for it don't carry it unless I'm out for a multi day trip. For now I'm following Strow's lead and sticking with Mora's. I have even passed a few on to others in need of a good knife for their load out. So far I've been happy with that decision, but being a gear whore I never stop looking for "the one", preferably without spending $300+ on one. Right now the two I'm most interested in are the Essee 4 now that they're offering them in un-coated blades. The other is made by the Pathfinder Schools in-house knife brand PKS, specifically the Scorpion model. Both appear to be solid quality and intelligently designed without charging an arm and leg. I guess a definition of sorts for what I'm looking for might also be helpful. Full tang, high carbon steel, blade length of 4-4.5", 1/8" to 3/16" thick, uncoated blade. Kydex sheath, but I'd prefer a folded over style instead of the two sided with rivets on both sides, just seems more compact and fewer points of failure. A ferro rod holder integrated would be a bonus but nor mandatory. I've also made it a habit to Gorilla tape two needles on the back of my sheaths, a large sail cloth needle and a smaller but still beefy enough to push through denim (or skin if I should ever have the need). Keeps them handy and never have to remember to pack them. Both knives tick those boxes. With either I'd likely end up getting a custom sheath by one of the handful of reputable kydex makers around my neck of the woods. Both are also right around $100 which is about as much as I could justify spending on a knife. Not to say a $300 knife isn't worth it, but I'm a fan of tools I don't feel like I've spent so much on I'm scared to use it. I like the more classic looks of the PKS knife a bit more but can certainly respect the proven-ness of the Essee. Other than that it'll probably come down to whichever one strikes my fancy most the night I finally decide to drop coin on one. Alpendrms, thank you for bringing the KB Knives to the forefront of discussion. Very useful and practical info. All, thanks for sharing what you are doing with KB knives, and why. Here's my thought process and results. Blade about 3.13" x .19", OAL ~7.6", 1095/US made, one piece knife with a small pry tip on handle end. Pcord wrap handle, trade off of sub-optimal grip function for reduced bulk, about 4.5 oz. Kydex sheath, practical for protection of KB and light weight(heart prefers leather, brain staying practical/kydex). Rides in or under the KB. Knife as tool. General purpose, including batoning firewood. Stronger than a folding knife. Small, handy pry tool. On my body all the time, as a first/last line of gear, thus, "Level 1". Northern Rockies. 4 seasons. Snowshoes with pulk in winter(not pretty on skis, admire those who are). Function over form. When out and about, KB is where the old "on-body/in pockets and onbelt load" now lives(eye glasses in shirt pocket, that's about it). Other than sleeping, pretty much wear the KB all the time. Long time acclimated to wearing upper body protection, so, easy acclimation to wearing the KB(kind of comforting). Day hike with enough gear to spend the night, in moderate comfort, including HPG MS, Exped Multi mat, tarp/poncho and about 4 qts of water (on the PB), plus comm gear(InReach Expl.). Umlindi, with Pbelt, HPG pouches and a Tara pocket. OKB or HRKB worn under, and attached to the HPG harness. Personal preference for the "lumbar pack" qualities of the Umlini + rig (body size is not small, wear the Umlindi as a lumbar pack). Wear PB on "backpack" waist, so, load is low, close, and centered. Overnights use an external frame with HPG suspension, pack bag, stuff sacks, and compression system(IGM). Old school, perhaps in too many ways. Seen enough from both sides of challenging situations to not want to be under prepared, and willing to pay the price for being prepared(kind of comforting). Seems proximate to niche/choices of others. Looking forward to learning about what others are doing. Appreciate the insights and info. I guess a definition of sorts for what I'm looking for might also be helpful. Full tang, high carbon steel, blade length of 4-4.5", 1/8" to 3/16" thick, uncoated blade. Kydex sheath, but I'd prefer a folded over style instead of the two sided with rivets on both sides, just seems more compact and fewer points of failure. A ferro rod holder integrated would be a bonus but nor mandatory. If you don't like the coating on a blade (I'm not a huge fan of the epoxy coatings), you can remove the scales and use Kleen Strip or any similar spray-on paint stripper...just wear gloves and use a small scraper and brush to get in the nooks and crannies. Have some mineral spirits or denatured alcohol to clean the knife off after using the stripper. I've done that on a few blades, and then I usually force a patina on them with apple cider vinegar and mustard. I always love it when you provide some of your own mountain and backcountry wisdom! Thanks! I think the general dimensions you've outlined for a good Kit Bag-sized knife is right on the money! Lots of different brands, blade styles, steels, etc. I think the main reasons I really love the CPM3V steel is because of it's toughness, edge-holding qualities, relative ease of sharpening, and resistance to corrosion in wetter environments. That said, there are plenty of good, inexpensive knives out there that use steels like 1095 carbon and do quite well. The BK-11 (Becker Necker) I have is 1095 and it is a great little blade. Also really like your lay down of where you carry what, and why it is carried. It's a great thing when we can all share this kind of knowledge with one another, because we then all enhance our backcountry intelligence levels! At the very least, the seed is planted for encouraging further thought to eventually grow into sound application of equipment and skill out in the hills or on one's mission. spotfire & Hawk Creek.....thanks for adding your own thoughts and providing info regarding your own "Kit Bag Knives". 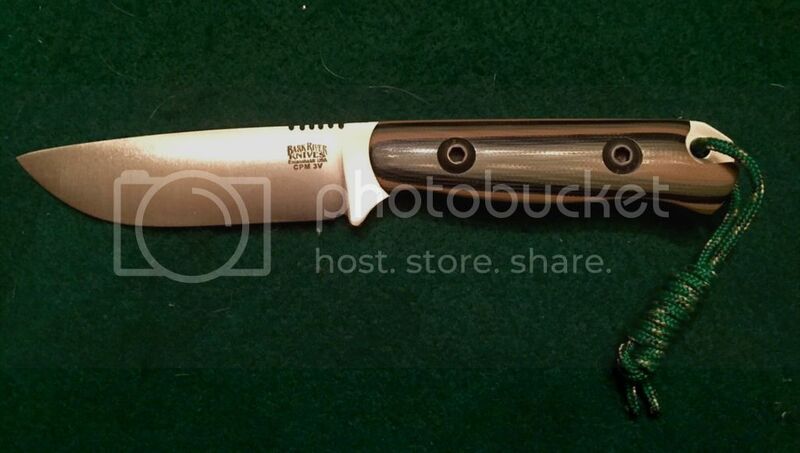 I knew about the Izula and considered getting that one before I ordered the new Barkie. I had an Izula 2, but gave that away as a gift to survival instructor Tim MacWelch. I hadn't thought about Gossman knives....I've heard good things about them. Since we're talking about Kit Bag knives and how much we all prefer, need, or want to carry either in or on the Kit Bag, I figured I would show some other options for different multi-tools. I have decided that most of the time I will not carry a full-size Leatherman in my Kit Bag. That will go in the survival kit pouch, or may not go along at all, dependent on the time of year, the location, and the duration of the trip. Instead, I plan to opt for a small, mini, or micro size tool for carry in the Kit Bag. I always prefer a pliers-type over scissors. If I am carrying a small fixed blade as my Kit Bag knife, then one of the smaller tools can go along. A larger (full-sized) multi-tool would then go in the main pack, or maybe not at all for the reasons I mentioned above. Pictured below are some of my current options. A Nite Ize tool, a Swiss+Tech tool, a Leatherman Style P1, a Boker Magmun Mini Multi-tool, and a Leatherman Wave. I may actually pick up a couple of the Swiss+Tech 19 in 1 Micro Extreme tools, because of their added function in a very small package and low cost. When I leave the house I have an Emerson folder on me minimum, and usually a leatherman sideclip too. For stuff shorter than overnight the Emerson just stays in my pocket. Overnight, if I remember, the Emerson stays in the rig, because I realized awhile back that one of the fastest ways to cut weight is to leave metal objects behind. The sideclip is small enough to fit in a pocket and ride there comfortable, and gives me a back up knife. I always have a Gerber saw in my pack, and typically one fixed blade along. For the past several years it has been a Surefire Echo more than anything else. It fits very well on the bottom of my kit bag and just plain works for me. I guess if I had one complaint, other than serrations, is that it is a bit short for batoning, but that is also part of why it fits so well on the bottom of my kit bag. Those three tools are the always with occasionally the Emerson along. During winter trips I will add a hatchet/axe, but the rest of the year leave that weight behind. Got my new primary "Kit Bag knife" in the mail today. Bark River Bravo Necker 2. Very happy with this purchase. Perfect size for in or on a KB. Just big enough to be able to baton with on medium wood (3-3.5" rounds), I reckon. Before I got it in hand, I thought I would probably take the scales off and do a cord wrap in order to keep it as thin as possible, but still usable. Now that I have handled it, I realize that the scales are plenty thin enough and still very comfortable! My hand is too big for the handle, but if I need extra control, I made a pinky loop lanyard for it. Plus, the jimping is just right. It came hair-poppin' sharp, too! When I roll with my Heavy Recon KB, I'll use the Kydex sheath and attach it to the bottom of the KB, when I'm rolling with my original model KB, I'll use the leather sheath and just dummy cord it to the inside of the KB. One interesting thing, and possibly a drawback, about the leather sheath it came with is that it has a pretty strong magnet encased in it. This holds the knife firmly for when it is being carried inverted as a neck knife. How is that a drawback? Well, if I'm not paying attention when carrying the knife in my Kit Bag and want to use my compass to shoot an azimuth, if I were to hold the compass too close to my chest while determining or setting an azimuth, that magnet will no doubt throw off the needle! Big items like rifles, pistols, magazines, & the like are immediately evident as items that would throw off the compass...but a sheath? Guess I'll just have to remain cognizant of that. I'd like too add a small tidbit to the KB knife discussion. After some time with my Gossman UNK I'm am sold on the modified sheepsfoot style blade. As a stand alone tool for the backcountry it would be a bit small but paired with an axe or saw it'll do anything I need a knife too do. Recently I came across the Frog Leg kneck knife from Diaz Tools. Similar size and blade shape too my UNK but with just a skelotonized handle. If I can convince him to make me one out of 3V I'll be picking one up soon and that very well may end up as my dedicated KB knife. Sweet! I've toyed around with removing the scales on the Bravo Necker II I bought and just doing a paracord wrap. Not sure I'm going to...the scales on it feel very comfortable and they really aren't very big. After I've had the knife for a while, I may give it a try without the scales.